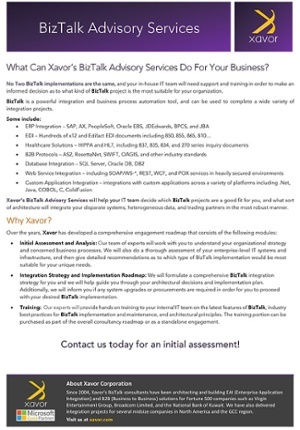 How can Xavor help you with your BizTalk implementation? Microsoft BizTalk Server has been endorsed by Gartner as one of the “Leaders” in the Enterprise Integration space. Per Microsoft, the Integration Solution has been installed by over than 12,000 customers, including 81% of the Fortune Global 100, who are using BizTalk Server to facilitate: payment processing, supply chain management, business-to-business EDI, real-time decision making, and reporting. BizTalk Server is not an investment in a new software, rather it maximizes the ROI of your current IT investments by increasing your business efficiency and reducing turnaround time.